Roo's been needing constant activity this summer, so I've been keeping an eye out for fun things to do with her. 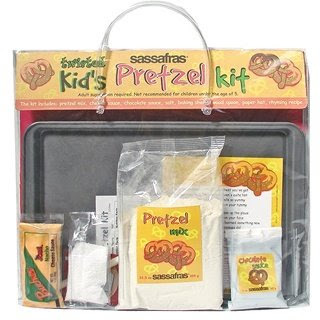 I bought this Sassafras Kid's Pretzel Making Kit at a local craft store a while ago and whipped it out last week. Both kids love getting pretzels at the zoo so I knew this would be a hit. Roo especially loved rolling the pretzel dough into rods and then choosing shapes to make. Dipping them into the baking soda/water mixture was also thrilling. Hearts, snakes, triangles and more… yum! Check out Sassafras for all sorts of cool activities for kids and grown-ups. Wow yummy! In a salty sort of way. Those look delicious. Well done! As always I adore her outfit! Summer just started. That girl is just a party a minute, isn't she? It's very cool that she likes to bake, I remember the cupcakes she made too. Will she be making Jasper's cake? Looks like you had a fun couple of days, with tie dyeing and making pretzels. And I like my pretzels salty! I also like baking in a princess dress too. Pretzel making looks like a fun activity. And I love the way they came out. Look at her making pretzels in her princess dress! What a fun mommy/daughter activity!